A Few Hexagons and a Bunny! Welcome to my portion of the Team Stamp It Easter Blog Hop. You may have come here from the amazing Lori Mueller at Lori Dreams Stampin’ … so … welcome! If you started here, be sure to hop, hop, HOP to each blog in the hop. You won’t be sorry! I did not purchase any Easter stamps this year! But never fear … I made do with what I already own. I did find the cutest bunny in the stamp set “Baby, We’ve Grown” … it’s not just for babies! I do need to let you know that I CASED this card from Dawn Olchefske. She has the perfect layout for this card…. I mean … why mess (too much) with perfection? I was looking to do something clean. I think this card nailed it! 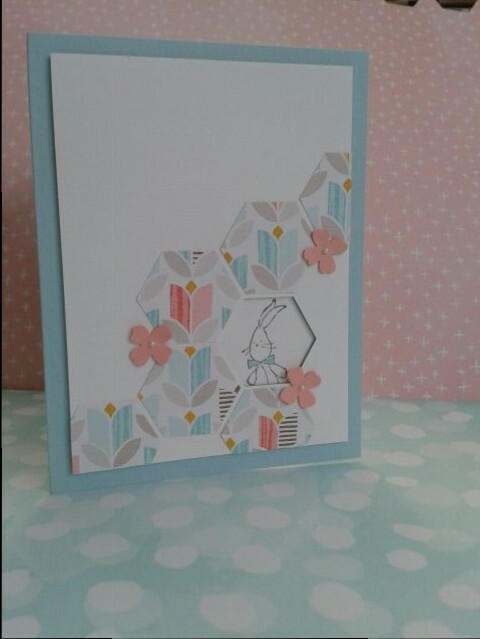 I used the tulip designed paper from Best Year Ever DSP to give my hexagons an Easter-y feel … The Whisper White layer was punched with the hexagon punch in the lower right hand corner of the Whisper White layer. I built the hexagon layout with 6 hexagons (3 of them hung off the paper and were trimmed). I made sure there was some white space between all the hexagons. I popped this layer up with plenty of Stampin’ Dimensionals so it wouldn’t collapse. I stamped the bunny from “Baby, We’ve Grown” on the punched out Whisper White hexagon in Chocolate Chip ink. I added just a bit of color with the Pool Party Stampin’ Write Marker to his bow tie. Just pop him into the empty hexagon space directly on the Pool Party card base with some adhesive. Add a few Crisp Cantaloupe Flowers punched with the flower from the Itty Bitty Accents Punch Pack and add a basic pearl in the center of each to finish the card front. 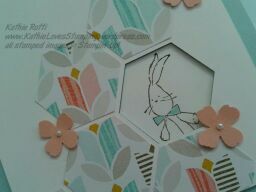 The inside of the card simply says “Happy Easter” from “Teeny Tiny Wishes” stamped on Crisp Cantaloupe and punched out. A few more DSP hexagons tie in the simple theme of the card front. This card will be duplicated and mailed out to some of my loved ones for Easter! Be certain to continue on to Rhonda Price’s blog at Paper Wishes and Stampin’ Dreams to see what she has to share with you. I am sure it’s wonderful! Look below to see everything I used to make this card. Very cute…like you said…clean and perfect! !